Several years ago, I visited Innsbruck (map), the capital of the state of Tirol in Austria, in the summer. The approach into Innsbruck Airport was absolutely spectacular and I wrote about this in my Plane Views – Innsbruck post. Surrounded by the stunning peaks of the Tirolean Alps, the views as one lands or takes-off from Innsbruck, are truly astounding. On my most recent trip to Innsbruck, this time in the winter, I was yet again treated to awe-inspiring aerial views, both before landing as well as during my return flight. This trip confirmed yet again that Innsbruck is one of the most spectacular places to fly into (or out of). Snowy peaks and broad valleys can be seen before landing in Innsbruck. Innsbruck Airport in the shadow of towering mountains! I spent a few days in Innsbruck for several meetings before returning home. The breathtaking mountain scenery never fails to amaze me! And the best part is: everywhere you look, you’ll catch a glimpse of the beautiful mountains! 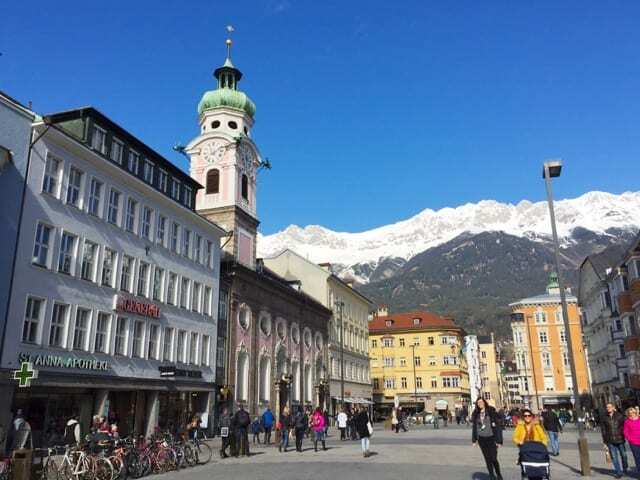 I spent a few days in Innsbruck – such a gorgeous town! Stunning mountain scenery everywhere I looked! The runway at Innsbruck Airport. Note the mountains on three sides. The mountain vistas came into view as soon as the plane took off. This is the town of Axams. We also flew past various ski runs. The majestic peaks of the Tyrolean Alps. If you’re ever flying into Innsbruck, make sure you book a window seat! If the weather is clear, you’re in for a treat! Thank you Ricardo for your comment. It’s just spectacular isn’t it? Very cool that you got to experience it from a propeller aircraft. I can imagine how adventurous that felt. Dear Keith, I spend Carnival holidays (one week off for us in Brazil) in Innsbruck in feb 1996. I flew Tyrolean from and to Germany and what impressed me best was the side view of the snow rocks seen form the plane on both sides. The sensation was stunning and the propeller aircraft gave us a plus feeling of adventure. Lovely place. I bet it is! I heard that they need special training to be able to land/take-off from Innsbruck. Apart from the turbulence, this airport must be a favorite of pilots to take off and land at!